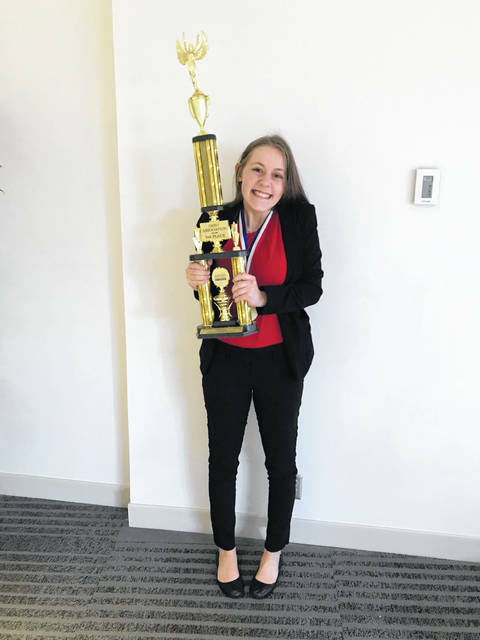 Greenville High School senior Rachel Unger recently received a third place trophy at state competition, earning her a trip to the Business Professionals of America National Conference in Anaheim, California. GREENVILLE – Greenville High School senior Rachel Unger has been selected to attend the 2019 Business Professionals of America National Leadership Conference in Anaheim, California. The conference will be held May 1-5 and will offer Unger the opportunity to join nearly 6,000 delegates from across the United States to compete in national-level business skills competitions and attend leadership development, workshops, general sessions and national officer candidate campaigns and elections. Unger, who is enrolled in Greenville Career Tech Center’s marketing program, will compete in the Advanced Interview Skills. Last year, Unger competed in the Interview Skills category, placing eighth in state competition. This year, she earned third at state with Advanced Interview Skills, earning a trip to nationals. Unger’s goal is to combine a marketing and fine arts education into a future career. She plans on attending Wright State University this fall. She also is studying at the Tejas Gallery in Dayton, for which she is receiving advanced placement credit. “I’m passionate about my art,” Unger said. About choosing the CTC’s marketing program, Unger said “there’s so much creativity involved. It’s an activity-based instead of test-based” curriculum, she said of the hands-on approach to learning. The class also has offered Unger and her fellow students the opportunity to create marketing pieces for local events, for example the YOLO Race and school activities. “I really enjoy the creative aspects of the class,” Unger said. At BPA nationals, Unger will participate in the officer elections and has been chosen to be a page/runner during the conference registration process. Unger will be accompanied to nationals by GHS marketing instructor Kristi Homan. “Each year, the National Leadership Conference offers students the opportunity to showcase their skills and compete against other students from across the country and be recognized for their dedication and hard work they have put forth through the year,” Homan said. Unger is involved in the community and has been selected as a Darke County 20 Under 20. She and her family also are the organizers of Comforting Comforters, a blanket collection for the Community Action Partnership. Unger said she was inspired to start the collection program by the homelessness she has observed while traveling to Dayton for her art classes. This entry was tagged BPA, Business Professionals of America, Career Tech Center, Greenville, Greenville High School, Marketing. Bookmark the permalink.